The BIG Family History Fair is set to return, again to St Ives’ Burgess Hall, on 2nd May 2015. I’m very pleased to have spotted that The BIG Family History Fair is set to return on 2nd May 2015. Returning to St Ives’ Burgess Hall, Cambridgeshire, after a 3 year break, The BIG Family History Fair will bring together experts, local genealogy and history societies, and companies with products to help you with your research. 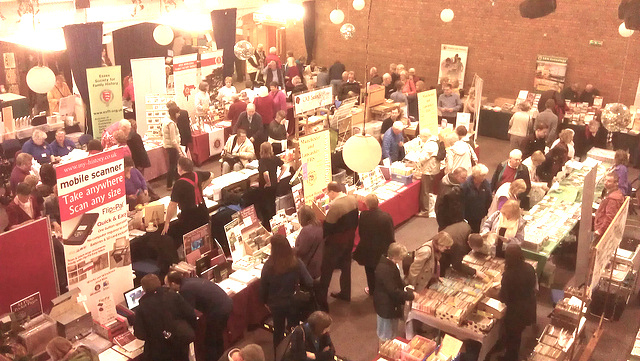 One of the halls at The Big Family History Fair 2012, St Ives. 2012’s show was busy – with expert talks full, and so this show will hopefully expand on that success, as well as prove to be just as successful. More information can be found nearer the time at the Huntingdonshire Family History Society’s website. With Who Do You Think You Are? Live scheduled just a few weeks before in Birmingham, this comes as a welcome treat.